Russian Prime Minister Vladimir Putin has been accused of interfering in a legal case after public comments about oil tycoon Mikhail Khodorkovsky. Mr Khodorkovsky is awaiting the verdict of his recent trial for theft and money-laundering. He is seven years into an eight-year jail term for fraud and tax evasion. In a televised question-and-answer session, Mr Putin referred to Mr Khodorkovsky when he said he believed "a thief belongs in prison". 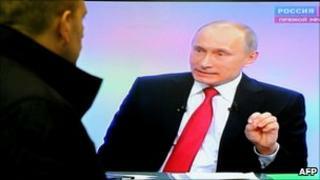 His lawyers said Mr Putin's comments "removed all doubt about who puts pressure on the court". They said the comments would assist in an appeal against the verdict, should Mr Khodorkovsky be found guilty. Mr Putin was answering questions on a broad range of subjects from ethnic tensions to the state of public housing and police corruption when questioned about Mr Khodorkovsky. He said: "We must operate based on the fact that Mr Khodorkovsky's guilt has been proven in court." Comparing Mr Khodorkovsky's treatment to that of the American multi-billion dollar fraudster Bernard Madoff, Mr Putin suggested Russian courts had been "liberal". On 27 December, Mr Khodorkovsky will receive the verdict of his second trial, in which he was accused of stealing hundreds of millions of tonnes of oil from his Yukos oil company and laundering the proceeds. If found guilty he could be forced to remain in prison until 2017. In a statement posted on Mr Khodorkovsky's campaign website, the tycoon's lawyers accused Mr Putin of "direct interference in the trial and direct pressure on the court". "I am very grateful to Vladimir Putin for what he has done today as he has helped us," Mr Khodorkovsky's lead lawyer Vadim Klyuvgant said in the statement. "Right at the time when the judge is working on the verdict... he [Mr Putin] removed all doubt about who puts pressure on the court and how this is done." Another of Mr Khodorkovsky's lawyers, Yuri Schmidt, said such interference was outlawed under Article 17 of the European Convention on Human Rights and as such would allow the defence to make a reference to Mr Putin in any legal appeal against an eventual conviction. "If Mr Khodorkovsky is convicted then in the legal complaint that we will make to the European Court of Human Rights we will write that Putin declared the guilt was proven just as the court was writing its judgement."